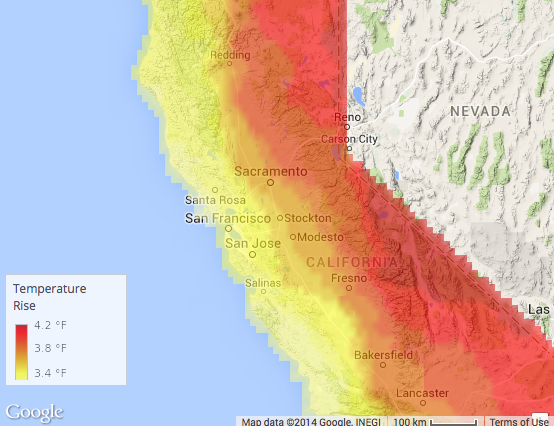 Cal-adapt is a web-based climate adaptation planning tool. Cal-adapt allows the user to identify potential climate change risks in specific geographic areas throughout the state. Users can either query by location, or click on an interactive map to explore what climate impacts are projected to occur in their area of interest. Cal-adapt synthesizes volumes of existing downscaled climate change scenarios and climate impact research and presents it in an easily available, graphical layout that is intended to benefit local planning efforts. The source data used within the tool are available for download, as well as further information including research organizations that have developed the data, and relevant scientific publications.